Now that the weather has improved and the spring is almost here, kids are moving out of the basement hibernation and outside to play. While we move away from the indoor games, it is time to get up and moving. A classic favorite, Twister has moved to a fast paced, color explosion fun in TWISTER Rave SKIP-It and TWISTER Rave Ringz. TWISTER Rave Skip-It has the player show off her skipping ability. I remember trying to get that skip rope to move lightning fast. The Twister version uses lights to encourage you to the next level. The goal is to get all four colors glowing. What I like about this game is that the player is up and moving. Kids need more physical activity in their daily lifestyle. This toys makes jumping around fun and less of a chore. Although this game is for a single player, it can be passed amongst friends as part of a competition. The person who can light up the most lights wins. This game is a great way to get kids off the couch. Just a reminder, make sure that you have adequate space to play. You don't want to break anything. As kids achieve proficiency with this game, you can create more tricks. Check out the Rave website for suggestions. 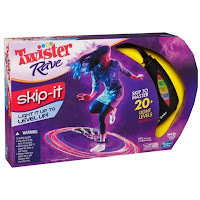 This TWISTER Rave Skip-It is available at retailers nationwide. It sells for approximately $19.99. If you have been around school aged girls (or were once a school aged girl), you might know about the hand-clap songs. TWISTER Rave Ringz puts a new spin on this classic game. Whether you play by yourself or with a friend, you need to get your hands moving to a beat. Each clap, twist and snap creates a different color on the ring. You get to chose to match colors with your partner or create a light/sound show on your own. If you need some inspiration, TWISTER Rave has some fun examples to get your moving and glowing to the beat. 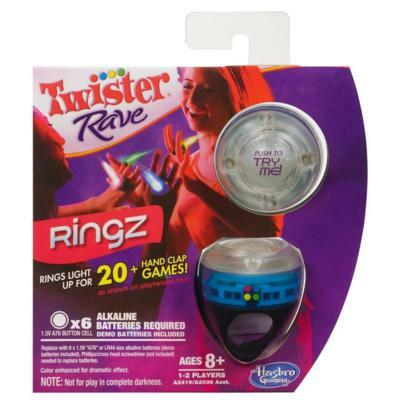 TWISTER RAVE Ringz is a great item to have for a Spring Break trip. It is compact yet can make wipe away boredom. Plus, it would make a perfect Easter basket item, too. This toy is available at mass retailers and the estimated price is $7.99. If you want to complete the TWISTER Rave line, there are two additional games TWISTER Rave Stickz and TWISTER Rave Hoopz. Are you ready to get up and moving with these Twister games? I'm giving them away to a lucky reader. Please use the Rafflecopter to enter. We LOVE all board games.. we especially like Sequence and Yahtzee. We play all sorts of games including Scrabble, Connect 4, Life, Monopoly, Family Feud and Cranium. We love board games. Right now it's been Life Spongebob edition and this Neopets board game I picked up at a thrift shop for $1. Our favorite right now is Monopoly....my son loves it! We love playing Monopoly Deal! We play Jenga on family game night! We luv Boggle and Scrabble. I have lots of board games we play. We are hooked on Uno Attack right now. We play a variety of games. Typically a host family sets the games. One night it might be video games, one night bingo, another night board games. It always varies. We like to play dominos. We like Yahtzee, Uno and The Game of Life. We recently got Nab-It, a word game sort of like Scrabble.